High quality solutions for (2006 - 2018 Papers & Interview Style Questions) written by an experienced Physics teacher which are presented as clear, easy to read, typed text with diagrams in a pdf file show you the answers as well as each step of the working out. They give you a detailed written explanation and guidance of how the answer is found. Buying these answers gives you the best chance to secure a high score on the PAT and therefore a place at Oxford. Please look at the FREE answers to the sample paper. These solutions are written by an experienced Physics teacher, tutor and senior examiner. They are used by over a third of those sitting the PAT each year. Now published and in stock as a paperback book available on Amazon and from other book stores. The test question papers are available here. After you complete the purchase using the secure shopping cart and Paypal an email will be sent to you. This will contain a password (which is needed to open the file) and a link for you to instantlly download a the pdf file which opens in Adobe Acrobat Reader (and many other programmes). If you require an invoice or to pay by cheque please send me an email to arrange it , but please use the secure shopping cart where possible. 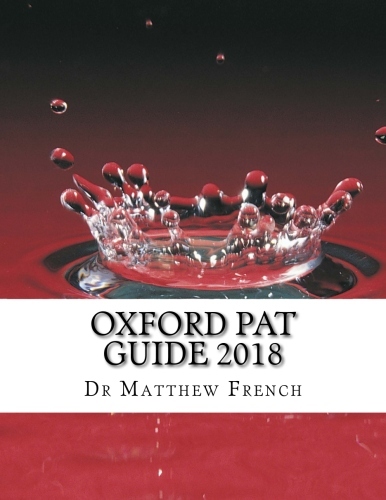 I also offer one to one tuition (either in person or via Skype and an electronic whiteboard) to help with all aspects of an application to the University of Oxford for Physics or an associated degree involving the PAT. © 2016 Dr Matthew French All rights reserved.